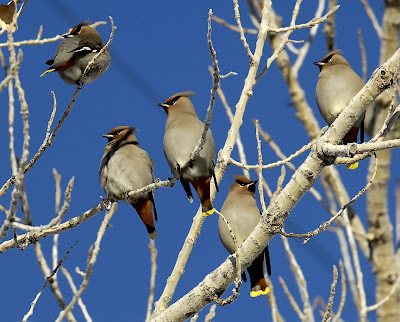 I've had the good fortune to run across several large flocks of Bohemian Waxwings over the last few weeks, but big bunches of birds create a bit of a problem- accurately estimating their numbers. Why count them? Well, for me there are three main reasons. 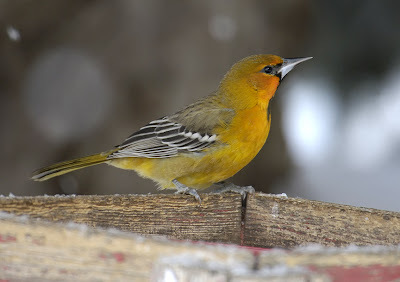 First, if you are on a Christmas Bird Count, numbers of birds are reported in addition to just the number of species. This yields interesting data- for example, the 707 Bohemian Waxwings found on the Boulder CBC this year is the most since 1987 when 11,000-some were found, and the 5th-most ever out of 66 previous counts. 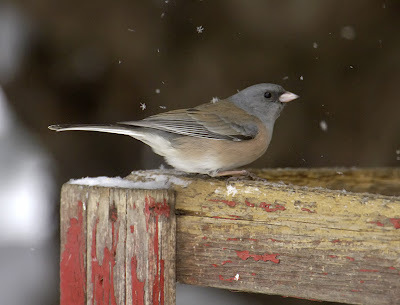 Second, it provides more useful data if numbers of individual birds are included for other bird monitoring projects rather than just using a species tick- for example, eBird species can be entered as just an "x" for present but giving numbers as well yields more information for the record. 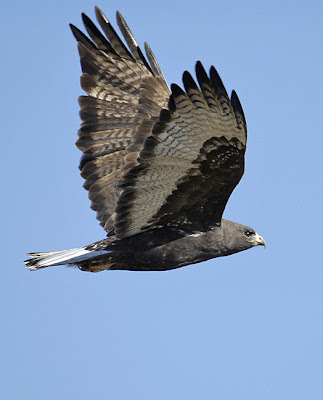 Similarly, Breeding Bird Routes and other standardized monitoring protocols call for numbers of birds to be counted. 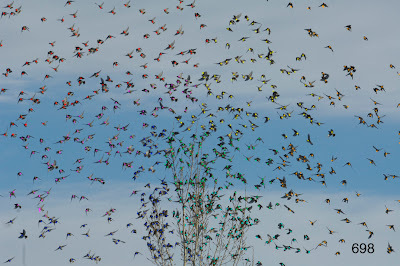 Still, it is a lot easier to count a few birds than a lot, especially if the lot of them are on the move. Like anything else, it is good to practice, compare estimates with friends (one good trick is to have everyone in your party think of a number without saying it and then to compare guesses.) I've found it instructive to photograph a flock or a part of a flock, guess how many birds are there, and then just buckle down and count them. 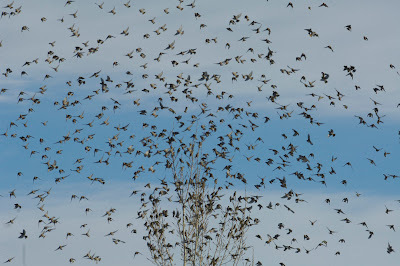 Typically estimates for large flocks are on the low side, especially with small moving birds (like waxwings!) 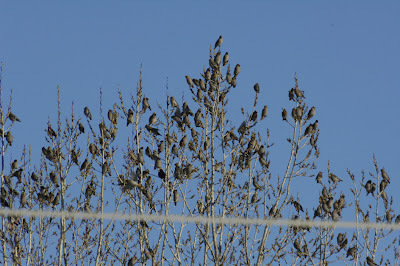 With that hint in mind, take a look at these Bohemian Waxwings to make a quick estimate of how many are there. 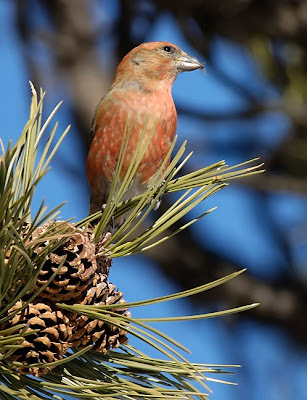 This first flock was found on the Longmont, Colorado CBC, so counting them wasn't just an academic exercise but a real dilemma. The answer will follow so don't scroll down until you are ready, but the point is to estimate them, not actually count them one by one. 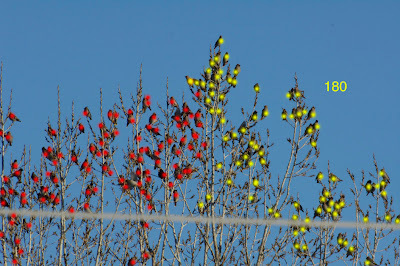 Click on the frame to enlarge it for a better look at the birds: Ok- have your number in mind? Scroll down, then. To figure it out for sure, I virtually spray-painted a little dot on each one so I wouldn't miss or double-count any. I used red dots for the first 100 birds and then switched to yellow for the remaining 80, for a total of 180 birds in that segment of the flock. They accounted for about 1/3 to 1/4 of the total flock, so the 500-bird estimate we used in the field wasn't too bad, but probably a bit low. Interestingly, each member of our team initially guessed three very different numbers- 400-ish, 500-ish, and 600-ish. I used the middle number at the time but it probably would have been more accurate to record the high one. Again, I used a different color dot for each 100 birds, using 7 colors but only 98 orange dots. Thus I count 698 birds in this frame, which I thought was about 1/3 of the total. I had guessed about 2000 birds so I wasn't too far off, but not surprisingly I was still low on my estimate. WildBird on the Fly is hosting I and the Bird episode #65- an eclectic combination of blog entries with birds as their connecting theme. I contributed a piece this go-around, too. Thanks, Amy, for putting it all together! Folks- scores of birders fanned out across the Boulder CBC circle on its 66th running today, spanning habitats including high foothills, urban jungles, riparian corridors, and eastern plains. Some met with strong winds and all had solid snow cover under blue sunny skies today, and open water was at a premium. (My group got passed by about 4 groups of snowshoers while looping around Betasso Open Space west of Boulder.) About the only calm water still uncapped by ice was at the Valmont Reservoir complex, which contributed two new birds to the Boulder count- Mew Gull (previously count week only) and Surf Scoter. 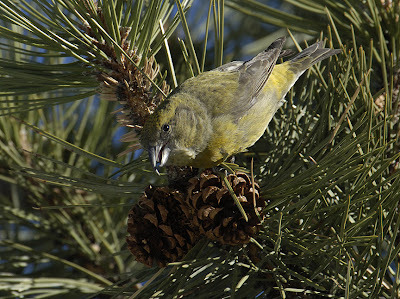 (For directions on scoping this restricted property see http://www.coloradocountybirding.com/county/bird_a_county.php?name=Boulder#387.) 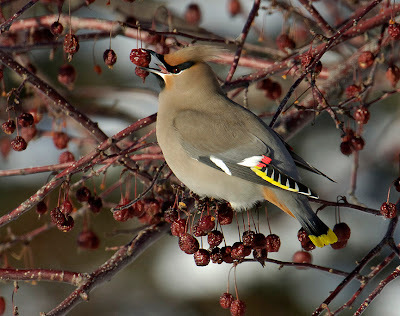 Many reports are still on the way, but we will certainly have high hundreds or even over a thousand Bohemian Waxwings. 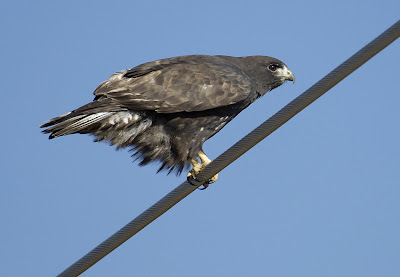 Other highlights include Chihuahuan Raven (only seen on one previous count, when still known as White-necked Raven), Lesser Black-backed Gull (2 previous counts), Eared Grebe (3 previous), Gray Jay (6 previous), and with 7 previous counts each, Black-crowned Night-Heron, Peregrine Falcon, and Lesser Goldfinch. Our day's list currently stands at 108, with two additional count-week species. Our biggest misses for now include Evening Grosbeak and Snow Goose, and we only have Merlin as a count-week bird. Hopefully a few species will be added as the remaining territory and feeder watcher reports are received. I'd like to thank all of the territory leaders, participants, and feeder watchers for their efforts- I hope everyone was as invigorated by the brisk air, snow, and blue skies as I was! Let me know if you think you have a goodie from today in the Boulder Area (Northern Pygmy-Owl or any Bluebirds, anyone??) or in the next three days of count week. Thanks again & have fun out there on all of the remaining counts! 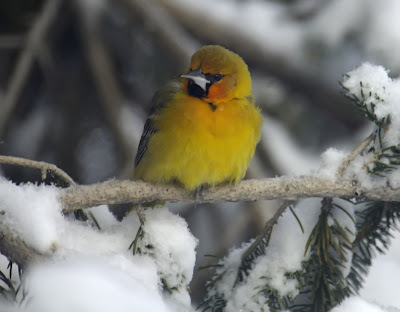 So, I'll leave you with a little Christmas Count ditty, penned by Colorado birding legend Bill Prather- thanks for letting me post this, Bill!! Oh what fun it is to study winter birds this way. Oh what fun it is to count and freeze your face all day! and a Beaufort Seven blow. GrEight birders with eyes peeled. Nine hours in the field. I think I might be ready to go birding again by May. Yellow... er, orange... uh, black faced... um, WHAT THE????? Yeah, an oriole!!! 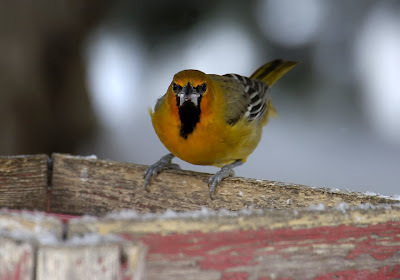 Nothing else that orange & yellow with dark face and a bill like that. But in December? In Colorado??? Guess so. 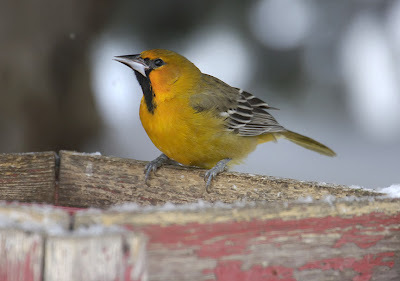 Connie got some pics and announced that she had an oriole on our state list (Cobirds), and some other birders who saw her pics raised the possibility that it could be a Streak-backed Oriole (which would be Colorado's first.) I got word of the bird and headed up yesterday afternoon, but was too late by about an hour, and I left in the dark snowstorm disappointed. I was hopeful that the bird could survive a night of snow and low temps (it got to about 10° F last night), but I can't say I was overly optimistic that anyone else would ever see it alive again. I set my alarm, though, and headed off to try again this morning. I arrived to find Al & Connie's cul-de-sac full of cars and their kitchen full of grinning birders- a good sign to say the least. Everyone had just seen it up close (like 15 feet away) and in the clear, but it had retreated into a spruce tree right before my arrival to avoid a Merlin's attention. Now, the worst words a birder can hear are "you should have been here ____ (minutes, hours, days, or whatever) ago...", but I was able to find it through a gap in the branches. Photographically impossible but at least I had it. Not to worry, though- several times throughout my stay it came down to a tray feeder on the ground to partake of the smorgasboard that was offered- grape jelly, an orange, mealworms, suet pellets, and a variety of mixed seed. I got some great shots along with everyone else through the kitchen window (with all of the shutters firing it sounded like Britney Spears had just came out of a nightclub to the awaiting paparazzi.) After a few rounds of this, I set up again outside, sitting on the ground against the garage wall to keep a low profile (and thoroughly chilling my glutes.) Sure enough, the bird continued to visit the feeder and I got some more images without the extra filter of double-pane window glass. 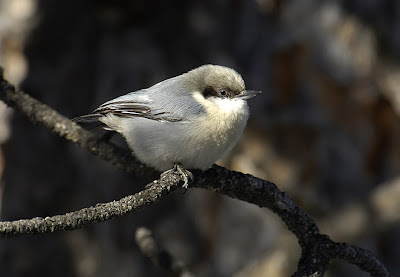 Schweet- lifer, photos, state bird all rolled into one. Thanks, Al & Connie!! This guy is on the dark end of things, but still has a little white streaking in the breast , belly, and crown. 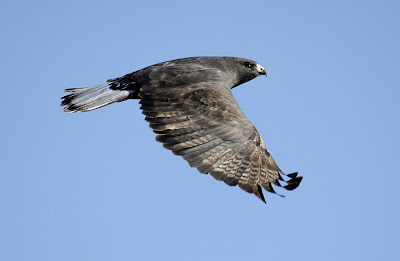 Dark calurus (western) Red-tails are just dark- no white streaking like that. Plus calurus 'tails have red tails, at least on the upper surface, unlike this Harlan's classic speckled white job with the subterminal dark band. Snazzy.